This fascinating and spiritual journey kicks off on the banks of the Ganges, in the sacred city of Varanasi: the ghats – hundreds of stone steps flanking the riverbank – are an incredible sight, particularly at sunrise when thousands of pilgrims bathe in the spiritually cleansing waters. From Varanasi fly to Agra, home of the world’s favourite monument to love; the Taj Mahal. You’ll then continue to the Pink City of Jaipur, in the heart of Rajasthan – here, the charming Samode Haveli will be your base whilst exploring highlights such as Amber Fort, the City Palace Museum, and the Hawa Mahal. Return to Delhi to explore the stark contrasts of both Old and New; from the narrow streets of Chandni Chowk bazaar to the tree-lined lanes around colonial Connaught Place. You’ll then board a flight up to Dharamsala, the home of the Dalai Lama, where Tibetan Buddhists have settled and built numerous monasteries and temples. 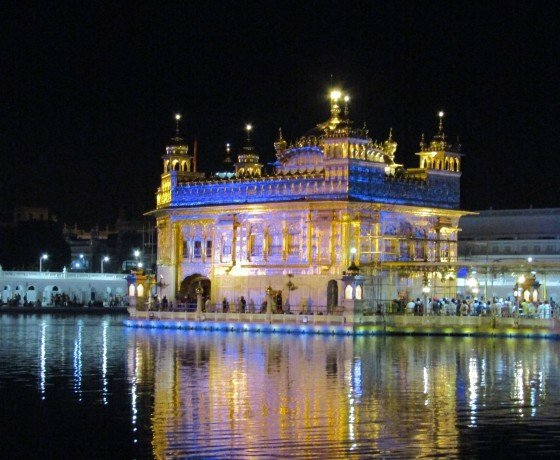 Your final stop will be Amritsar, home to the incredible Golden Temple, the most important site in the world for Sikhs. No two places on this unusual tour are alike, and together they span many centuries of Indian history and form the backdrop to landmark events such as the birth of Buddhism, Mughal invasion and rule, epic Rajput battles and British imperialism. Our Ganges to the Golden Temple Tour is designed to give you an idea of what’s possible, and is simply a starting point when crafting your tailor-made journey. Upon your arrival in Delhi, you will be met by a representative at the airport and transfer to your hotel. Depending on the time you land today, if you’re feeling active and would like to begin exploring your chauffeur is always on hand. We’d recommend a visit to the Lodi Gardens; a relaxing place to enjoy Delhi’s green spaces and uncover ancient Mughal architecture. Alternately, enjoy your surroundings at the Claridges – a great 4* hotel with character. This hotel blends old world charm with modern facilities, whilst being close to the main sites and shopping areas. The charming lobby is reminiscent of the 1920s, whilst the guest rooms are comfortable yet contemporary. The best thing about the Claridges, we feel, is the amazing selection of in-house restaurants: Dhaba, the north-west frontier restaurant has a rustic Punjabi menu and is always popular; Sevilla, the Mediterranean garden restaurant has great food and a romantic ambiance; Pickwicks, the all-day dining restaurant, is ideal for breakfast or a light bite. Board a direct flight to Varanasi this morning. Upon landing, you’ll be chauffeured to the Jukaso Ganges, where there’ll be a few hours to relax, settle in, and enjoy your surroundings. Located on Guleria Ghat right on the banks of the Ganges River, the location is ideal for those wanting to really immerse themselves in the Varanasi experience. The roof top restaurant and terrace area are perfect for simply relaxing and taking in the incredible scenes that take place along the ghats. Alternatively, a peaceful hotel away from the river – such as the Taj Gateway, the Radisson, or the Taj Nadesar Palace – is sometimes appreciated by our guests, particularly after a day of sightseeing on the Ganges. In the early evening, you’ll be met by your guide for a tour of the Ganges – and its many ghats – by boat, culminating with the evening aarti ceremony. These ancient rituals have changed very little over hundreds and hundreds of years. 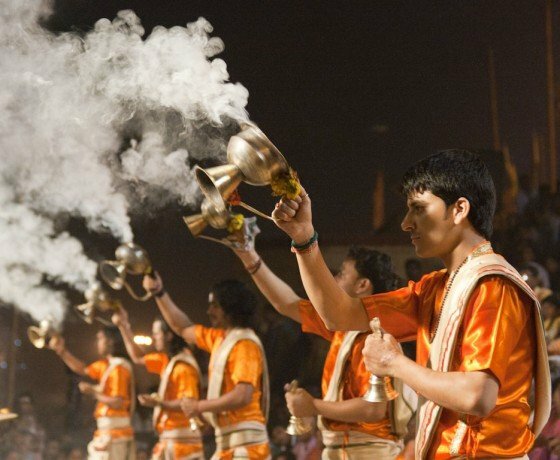 The scent of sandalwood and inscence swirls around, whilst the sounds of prayer chanting and clashing symbols rise to a crescendo. Hundreds of little oil lamps flickering on the river are a beautiful sight. Rise early and return to the Ganges this morning for a sunrise boat ride. A sunrise boat ride is the highlight of a trip to Varanasi, when the temples along the river front are bathed in soft light. The people of Varanasi trickle out of the labyrinthine lanes and head for the ghats at dawn. Later, visit Sarnath – where Buddha preached his first sermon after enlightenment, and the old city – a maze of streets and alleys crammed with derelict palaces, homes, and hundreds of temples and shrine. Here you’ll see funeral processions, cows and goats munching on whatever they can find! You’ll also explore a winding lane known as Vishwanath Gali, which is lined with a multitude of shops selling all manner of religious objects. It leads to the city’s principal shrine, the Vishwanath Temple. End the day at the 17th century Ramnagar Fort. Lying across the river Ganges, Ramnagar Fort has been homed to the maharajas of Varanasi for 400 years. Board a direct flight to Agra this morning. Upon arriving in Agra, the rest of the afternoon is at your leisure to enjoy your hotel; a bit of a mid-tour rest if you will! Set amidst beautiful gardens and is only a few minutes drive away from the famous Taj Mahal, the Trident is built of red stone reminiscent of the Mughal era, designed around a landscaped central courtyard with swimming pool, gardens and fountains. There is somewhat of a corporate feel, perhaps as the hotel also caters to business clients, but Agra is rather devoid of good character properties. With that in mind, we find the Trident to offer excellent value and superb service. Today you’ll continue to the Pink City – Jaipur. On the way, on the outskirts of Agra, stop off at Fatehpur Sikri for a guided tour of Emperor Akbar’s 15th century palace, which was abandoned after just 14 years. Upon arriving in Jaipur, an Indian Excursions’ representative will assist you with checking in to Samode Haveli, a quirky heritage hotel tucked away in a corner of Jaipur, originally built for a prime minister of the royal court in the mid-19th century. A full day of guided sightseeing in the Pink City. 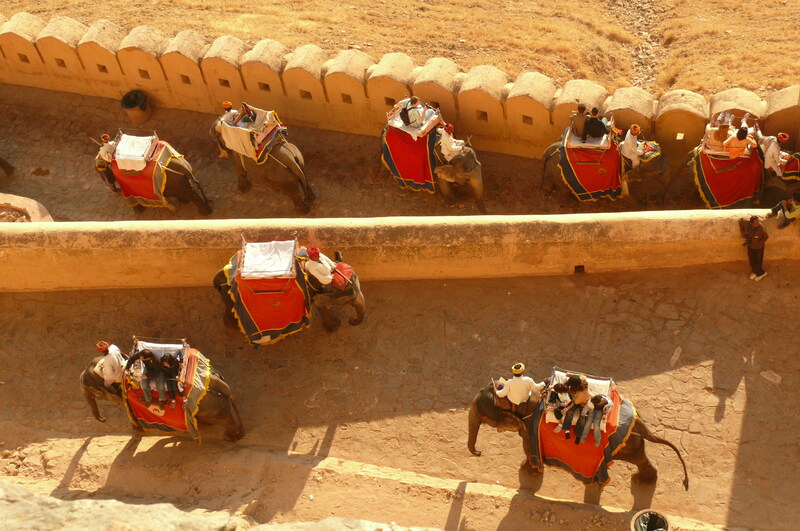 An elephant ride through the ancient Amber Fort and a tour of the City Palace will show you the best of Jaipur. You will also visit the Jantar Mantar observatory, along with Hawa Mahal (Wind Palace) and Jal Mahal (Water Palace). The morning’s at leisure in Jaipur to relax, hit the colourful bazaars, or further explore at your own pace. In the afternoon you’ll return to Delhi, this time for a two night stay to explore the sights. We’d recommend staying at the charming Maidens, one of Delhi’s oldest hotels, built in the early 1900s on the edge of the Old City. It has retained its colonial charm and architecture and has a large collection of photographs from the Raj period. The spacious guest rooms with high ceilings are unique when compared to the box-sized rooms of modern hotels. Set amidst eight acres of lush gardens, with mature, shady trees and swimming pool, it escapes the noise of the main city, but remains within easy access to some of the most magnificent Mughal monuments and famous shopping center, Chandni Chowk with its quaint bazaars and meandering lanes. A guided tour of both Old and New Delhi today will introduce you to the Jama Masjid, Qutab Minar, India Gate, Parliament House, Humayun’s Tomb and the Sikh temple. The itinerary we’ve prepared in advance is a guideline and is completely flexible to your preferences on the day – you may let your guide know your interests and he will tailor the day to better suit your tastes (we’re known for our flexible approach, allowing you complete control over the pace of your trip). After exploring the bustling capital, you’ll return to the Maidens. This morning you’ll board a flight to Dharamsala, one of the 80 hill stations established by the British between 1815 and 1847. It has a spectacular setting, being close to the perennial snowline and built along a spur of the Dhauladhar range. It’s also home to His Holiness Dalai Lama, who settled here following the Chinese invasion of Tibet in October 1959. Thousands of Tibetans have made McLeodganj their home and therefore the town has a strong Tibetan influence – monks in deep red are a common sight. Upon landing, you’ll be met by your guide to explore the Norbulingka Institute, a centre established in 1988 to teach and preserve traditional Tibetan art forms. There is also a stunning temple here, the Deden Tsuklagkhang, a magnificent example of Tibetan religious architecture, displaying some of the finest work done by Norbulingka artists. It’s the perfect place for prayer and reflection. This evening, you’ll check-in to the delightful Chonor House for a three night stay. A small friendly hotel of just 11 rooms, Chonor House has a wonderfully distinct Tibetan influence, with the décor in each bedroom depicting one aspect of Tibetan life in bold murals. There is a library, comfortable lounge and restaurant serving huge portions of delicious Tibetan, Indian and continental food (we’d recommend the Thenthuk; a traditional Tibetan noodle soup). Chonor House is not a luxury property, but it’s incredible energy and location – right opposite the Dalai Lama’s residence and monastery – make it a very special place. Today you’ll explore the highlights of Dharamsala and McLeodganj with your guide, visiting the Tsuglagkhang Temple, the Dalai Lama’s residence, the Tibet Museum, and the Namgyal Monastery. You may also like to visit the Church of St-John-in-the-Wilderness; one of the few remaining traces of of McLeodganj’s days as a British hill station. Return to the Norbulingka Institute today for a full day workshop in traditional Tibetan wood painting. Tibetan wood painting is a special technique of embossing, traditionally used to decorate furniture and the walls of temples. This technique of relief painting gives a three-dimensional look to the designs. We recently experienced the class and absolutely loved it, you can read all about our experiences by clicking here. A scenic drive today will take you to Amritsar. 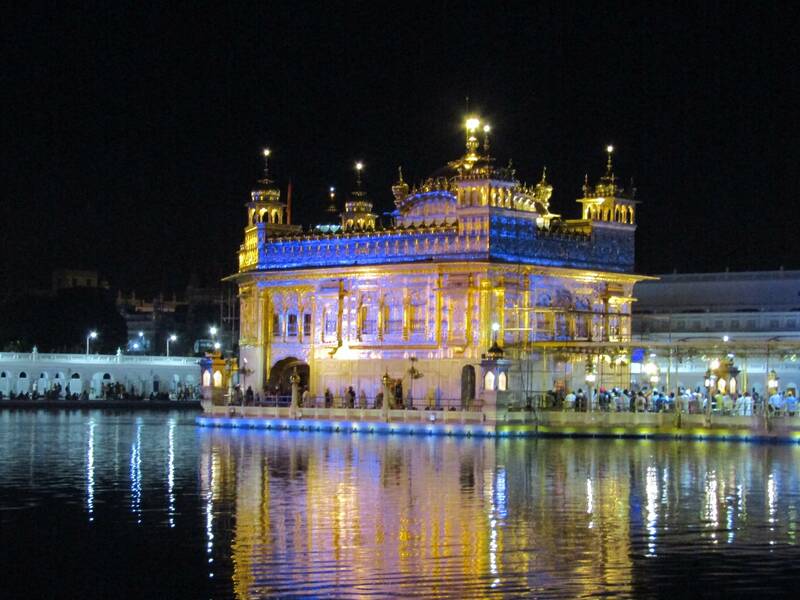 Founded in 1577 by the fourth Sikh guru, Amritsar it home to Sikhism’s holiest shrine, the spectacular Golden Temple. Upon arriving, there’ll be a few hours in which to rest and relax at Ranjit’s Svaasa. This 250-year old haveli is now a family run small boutique hotel in the heart of the city, owned by interior decorator Rama Mehra. There are two restaurants serving a wide range of options; from Lebanese, to Chinese, and, of course, Punjabi favourites. Or, you may prefer the Hyatt – the Hyatt is the most comfortable hotel in the city and offers all the mod-cons expected of a high class hotel. Those who’re seeking charm, heritage and an Indian-feel will be happier at Ranjit’s Svaasa, whilst those who value a big comfy bed and 5* facilities would prefer the Hyatt. Later this evening, you’ll be met by your guide to explore the spectacular Golden Temple at night, during the Putting to Bed ceremony. A unique and colourful ceremony, this daily ritual of putting the Holy Scripture to bed is a sight not to be missed on a visit to Amritsar. The temple is home to the Adi Granth, or Original Holy Book which is a collection of hymns of the great saints. 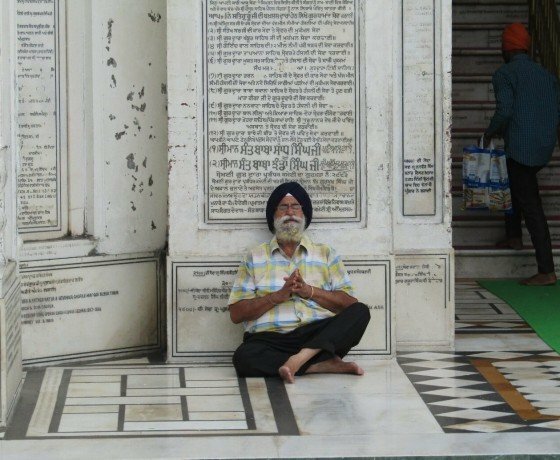 The book is a focus of devotion and during the day is kept in the Hari Madhir Sahib and is returned to the Akal Takhat every evening at around 9.15pm in winter and 10.15pm in the summer. The Putting to Bed ceremony was the highlight of our recent stay in Amritsar, you can read more about it by clicking here. 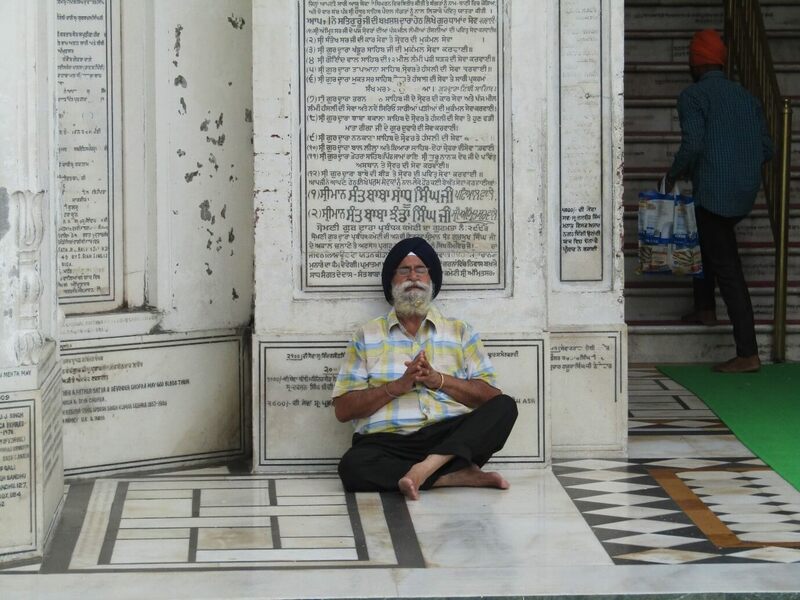 Return to the Golden Temple this morning for a more thorough exploration. Your guide will show you around the main area of the temple and explain the history and layout including the vast dining halls where all visitors, regardless of their religion, are invited to eat together. Perhaps the most incredible part are the kitchens run by volunteers, you will see vast cauldrons full of dhal, groups of ladies rolling out chapattis, meanwhile the noise in the background is the endless washing of plates. Later pay a visit to Jallianwala Bagh, a memorial to more than 1000 demonstrators who were killed or injured when the British, under the command of General Dyer, opened fire on them in 1919. To end the day, you’ll head out to Wagah, a village divided in two at Partition, where the daily closure of the border takes place with great pomp and ceremony. Indian border guards in khaki and Pakistani border guards in dark green march, bark orders and lower their respective national flags in a symbolic stand-off, watched by orderly crowds of thousands waving national flags. There is much partisan cheering in the grandstands as the gates clang shut for the night, to be formally opened again the next day. Today you’ll be chauffeured to the airport to board a flight back to Delhi. Alternatively, for those who’d like to experience the Indian railways, you can instead travel back on the train. Upon reaching Delhi you’ll return to the Claridges for a last night (or any other hotel of your preference; do let us know how we can tailor this experience to better suit your tastes). The itinerary we’ve described here is merely a starting point to share a flavour of the possibilities, and absolutely every aspect is flexible (from the hotels, to the destinations, to the length, to the sightseeing). For example, you may like to explore Rajasthan further by including stops in Jodhpur, Udaipur and/or Jaisalmer; or, take a Jeep safari in the jungle in Ranthambhore to spot wild Bengal tigers. Another possibility would be to visit Khajuraho between Varanasi and Agra, to take in the ancient carved temples. Whilst we have suggested some of our favourite places to stay, this itinerary is 100% tailor-made, and a specialist can help you select hotel options best suited to your tastes and budget. Let us know what you’d like to create and we can make it happen!